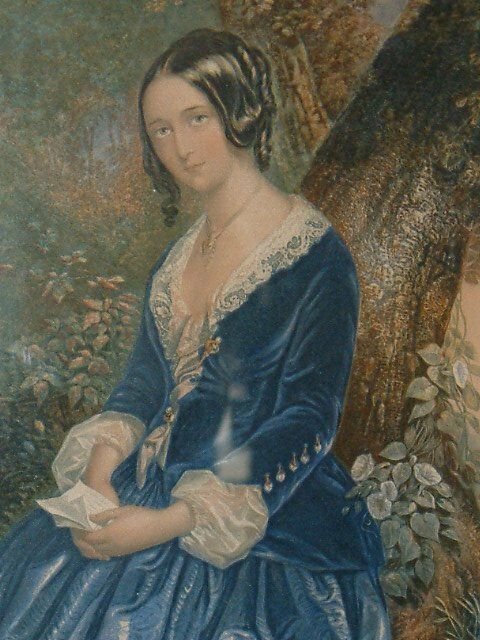 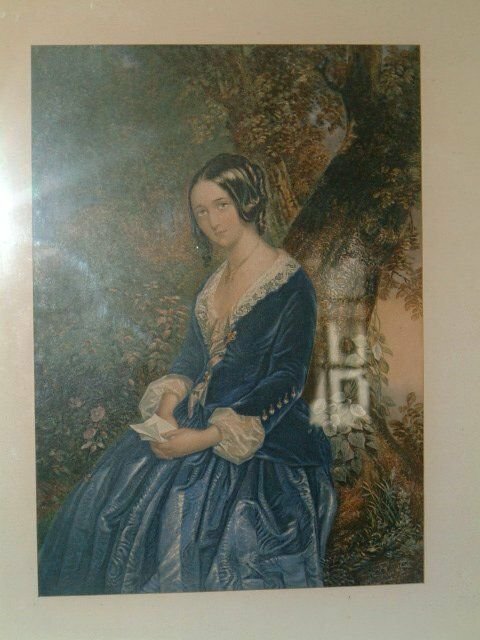 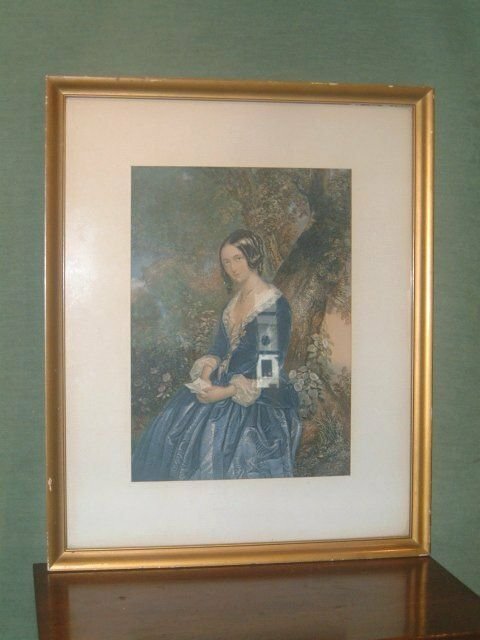 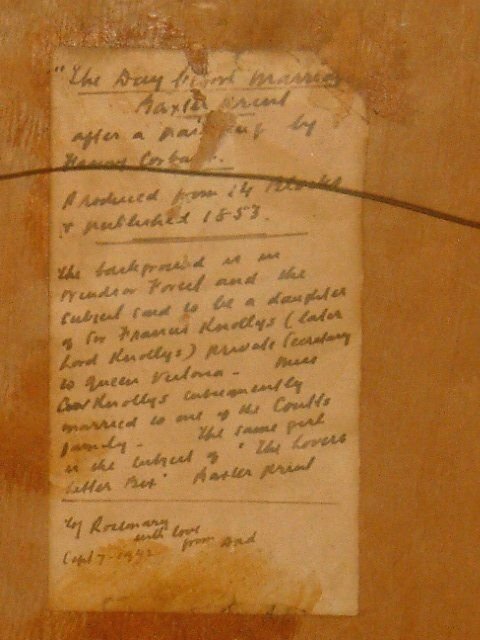 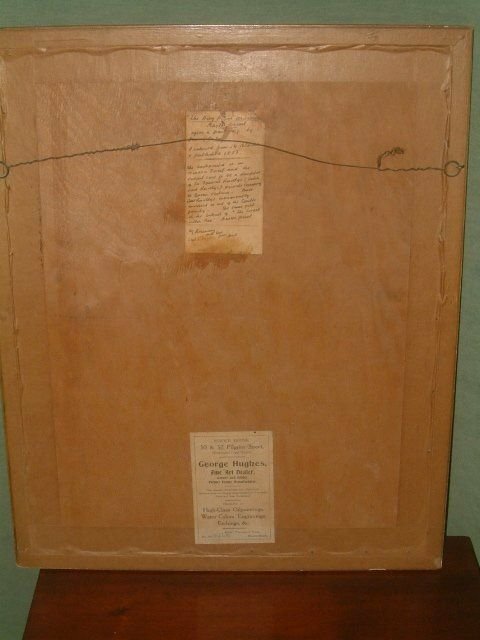 Baxter Print 19th Century “The Day Before Marriage” Bearing Labels to the reverse of picture. 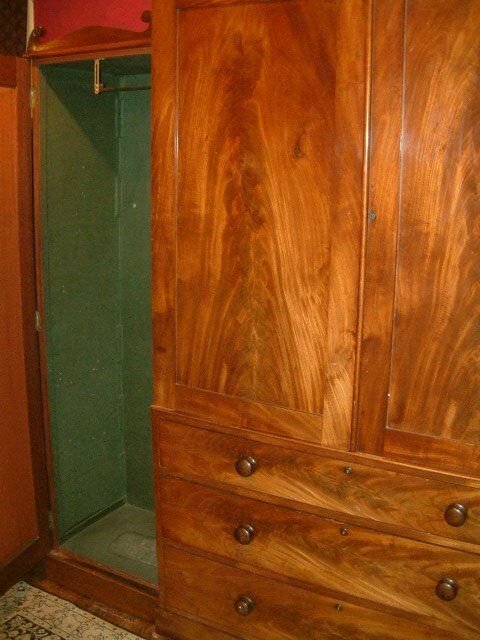 Good Colour & Choice of Timber. 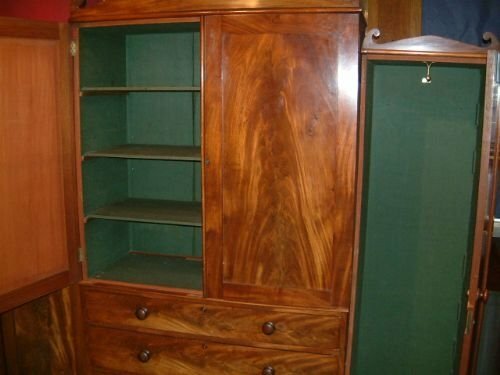 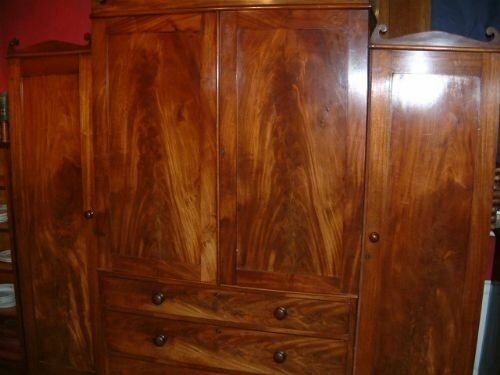 Superb Regency Period Mahogany Wardrobe with Linen Press Centre Section Superb Flame Mahogany Timbers. 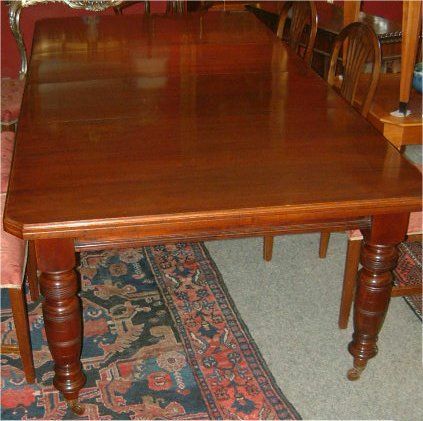 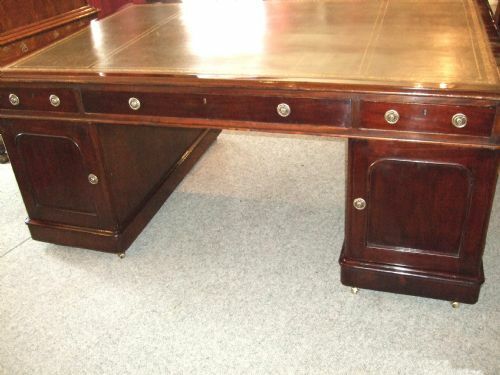 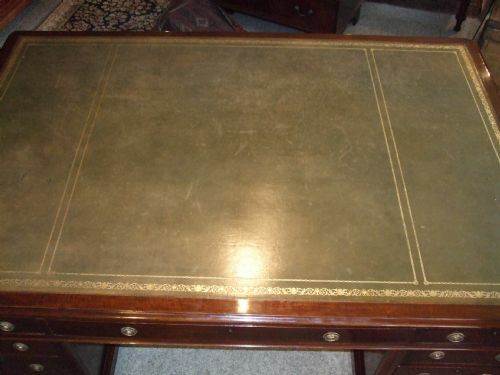 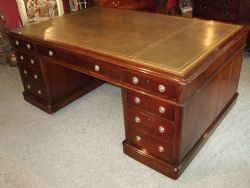 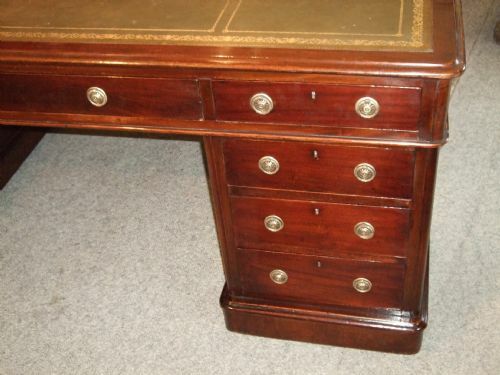 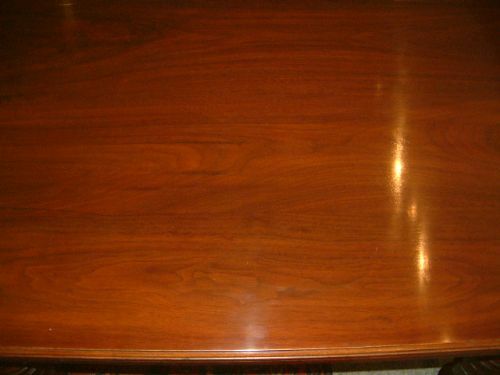 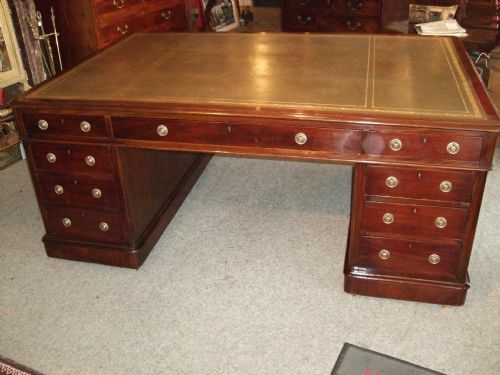 Victorian Mahogany Large Pedestal Partners Desk with Green Leather Top, with Drawers to the Front & Cupboards & Drawers to rear.On Brass Castors. 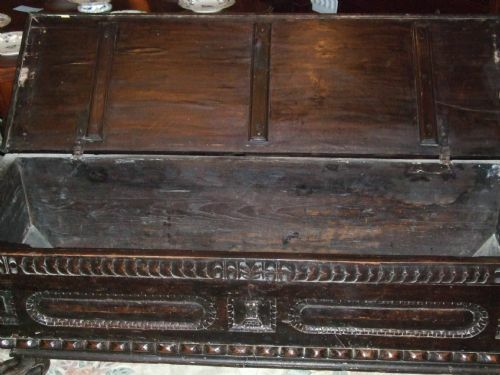 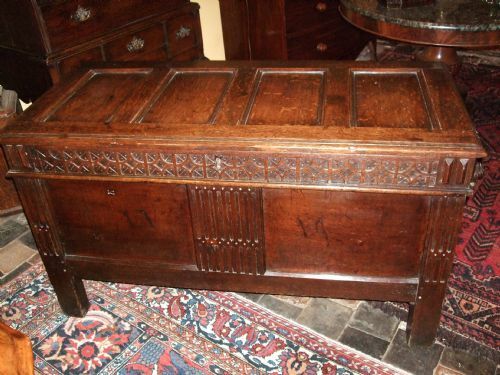 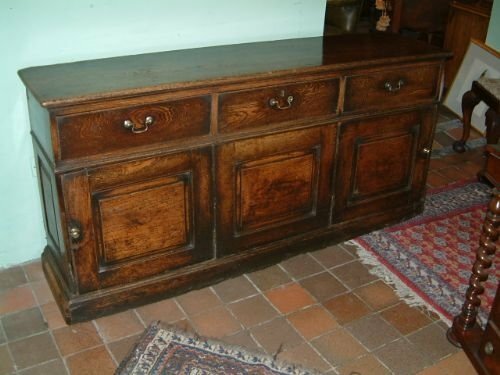 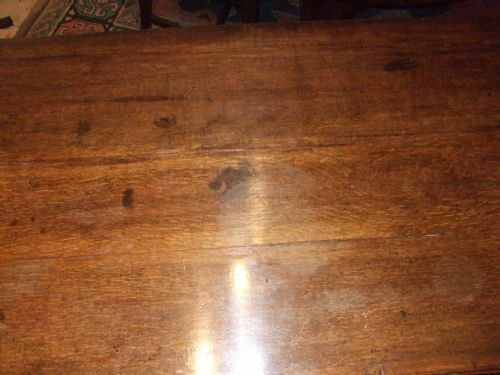 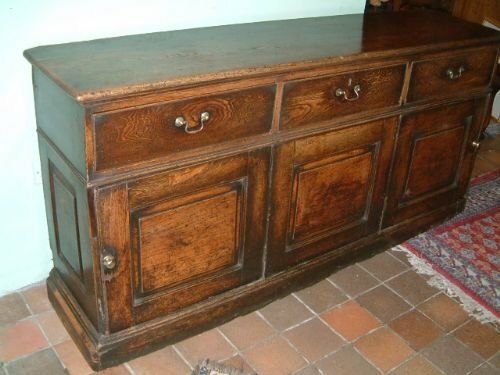 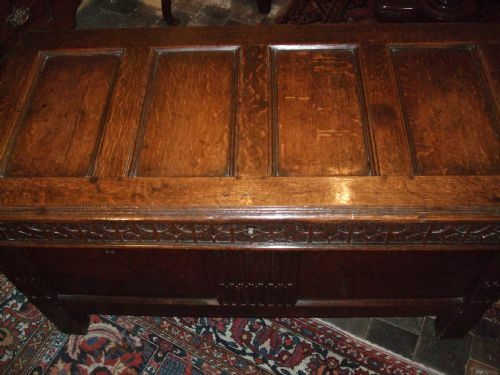 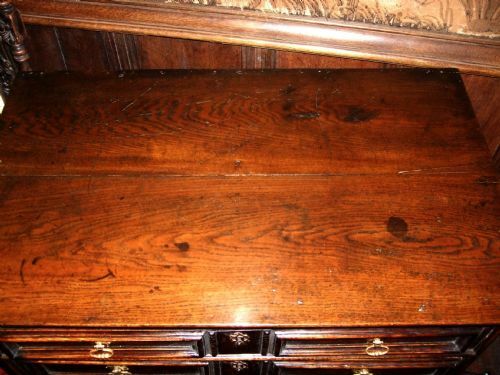 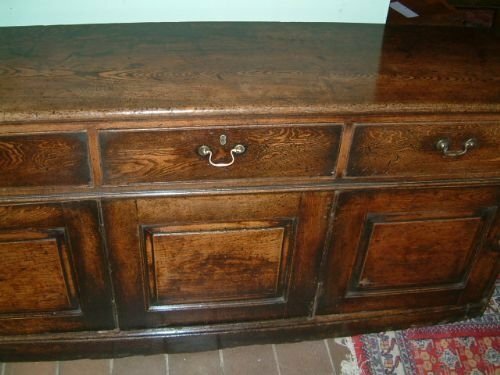 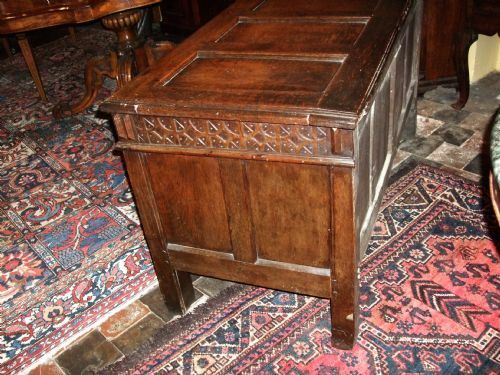 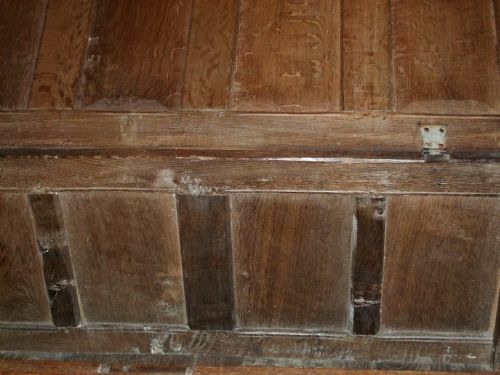 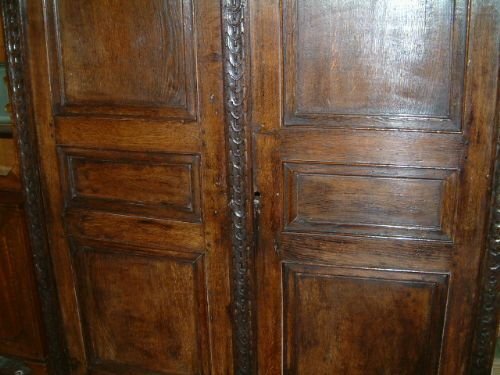 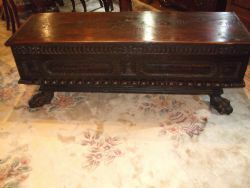 17c Oak Panelled Coffer with Carved Decoration Good Colour & Patination. 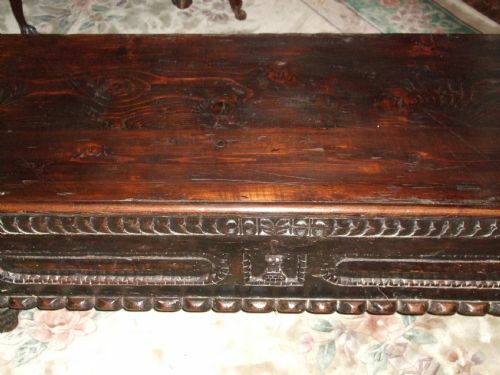 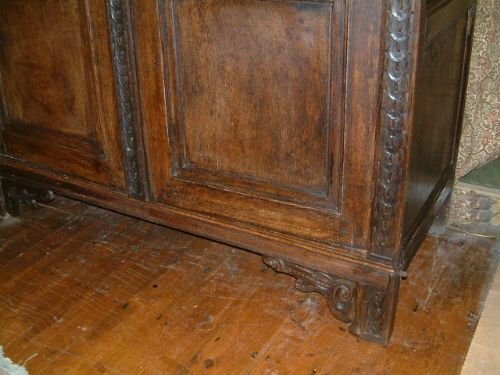 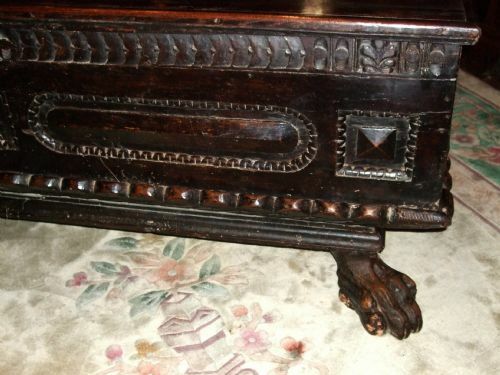 17th Century Italian Cassone (coffer) Superb Carving with Lions Paw Feet. 17th Century Jacobean Oak Chest of Drawers Geometric Moulded Front. 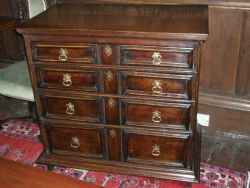 With Locking Drawers & Spring Locks. 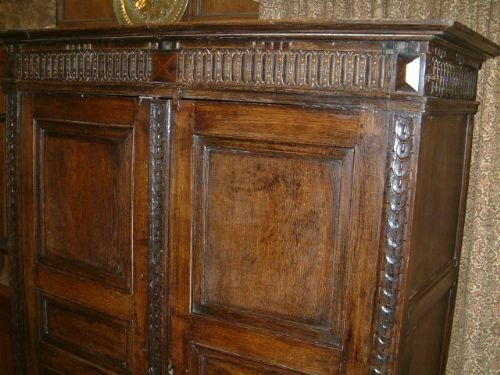 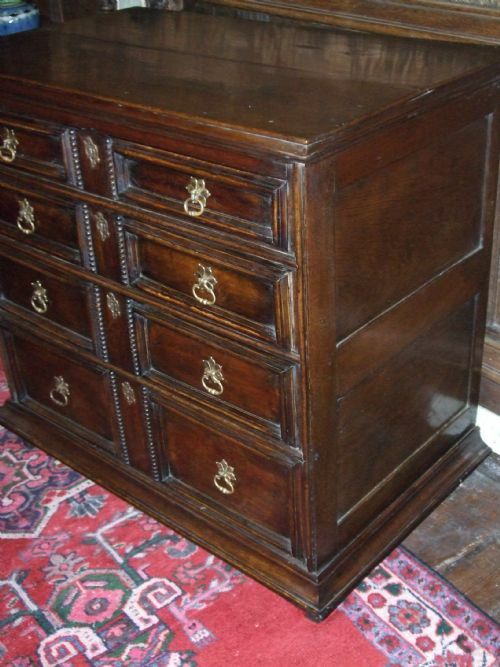 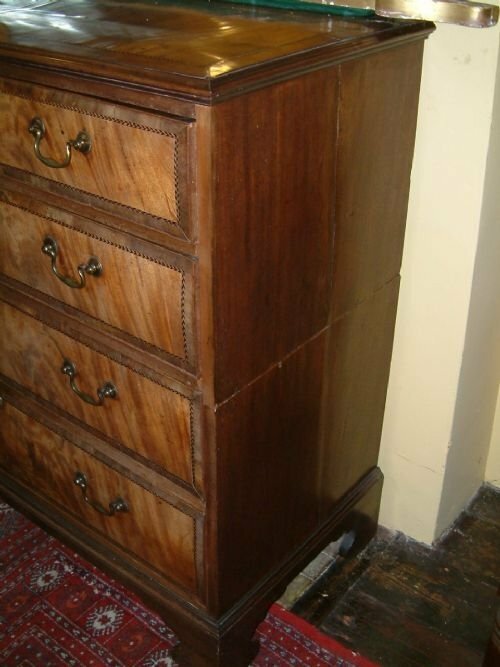 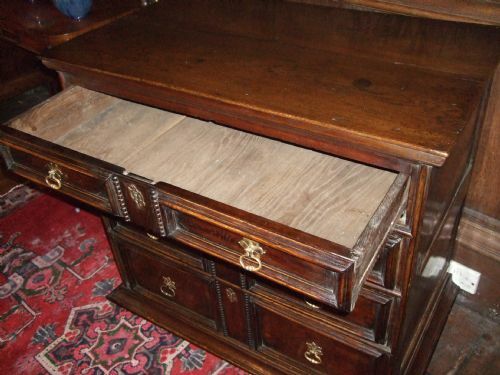 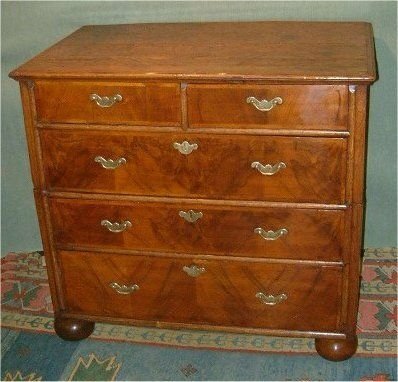 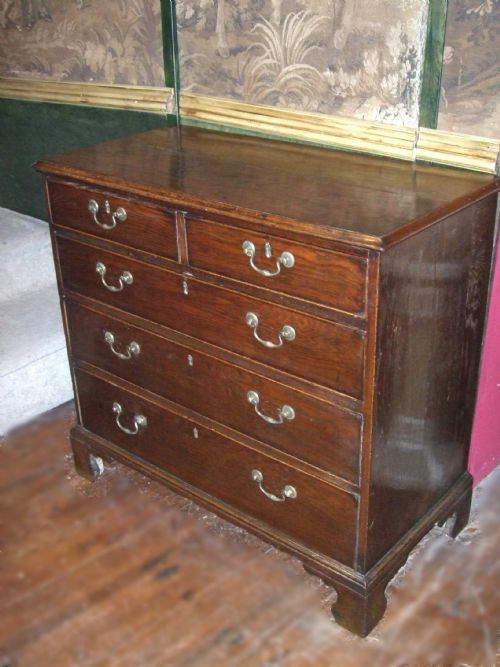 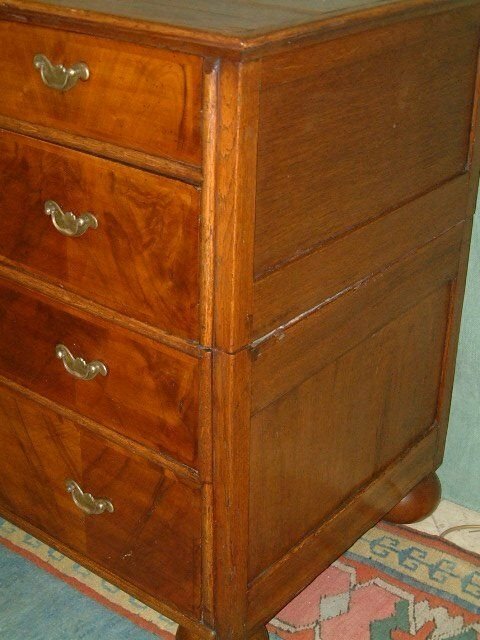 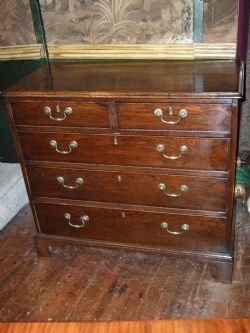 With panelled Sides, Nice Colour & Patination Later Period Brasses, Secret Locks to Top Drawers, Bun Feet. 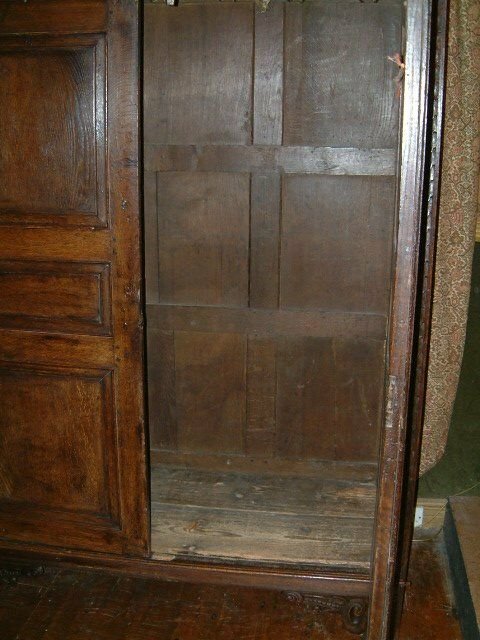 17th Century Oak Court Cupboard, Excellent Colour & Patination with some later restorations etc. 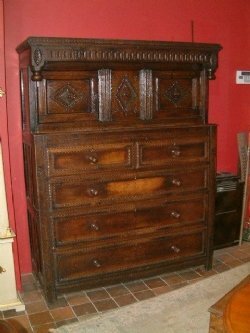 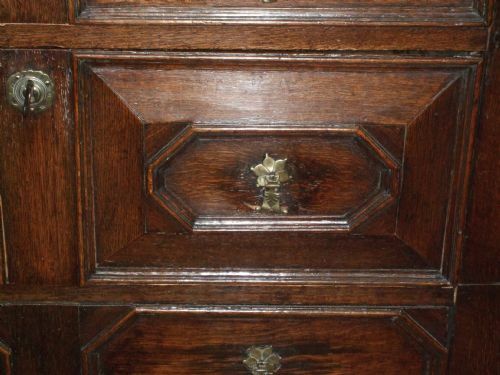 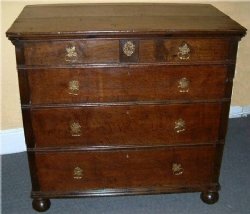 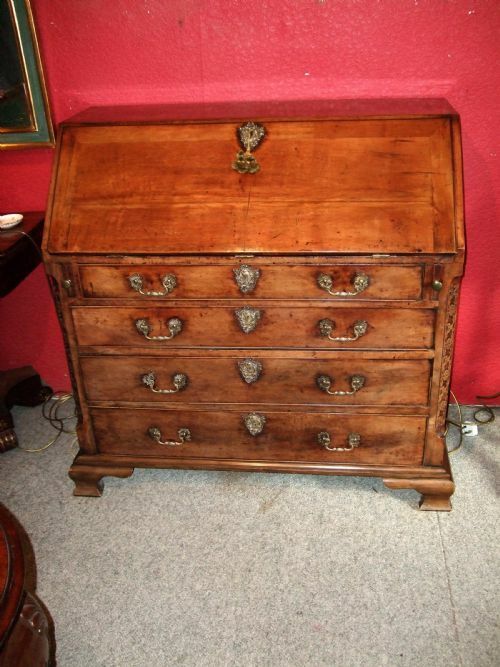 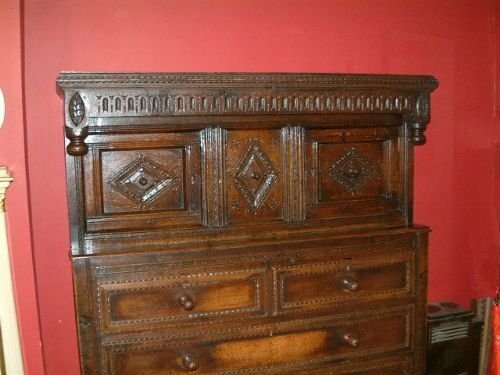 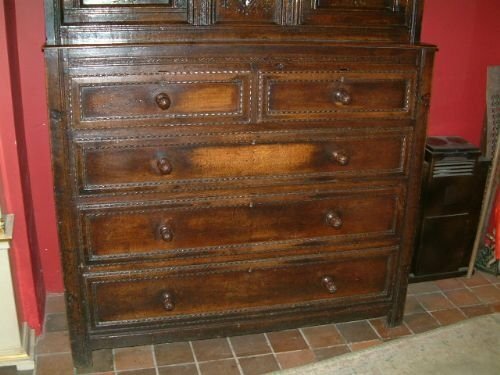 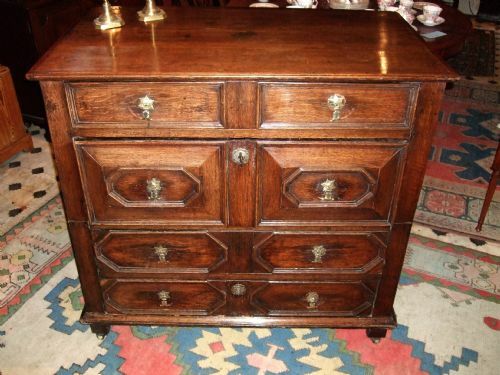 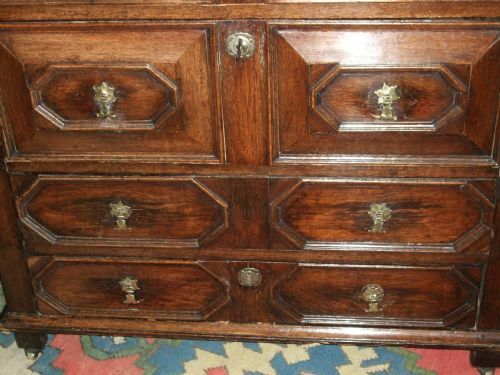 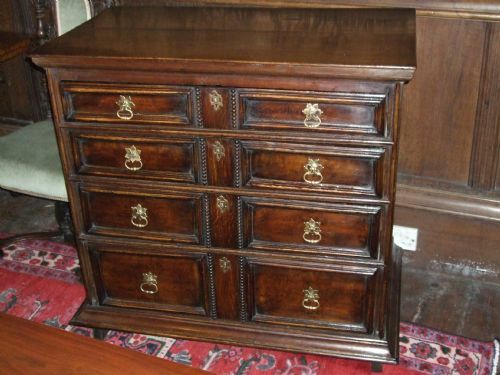 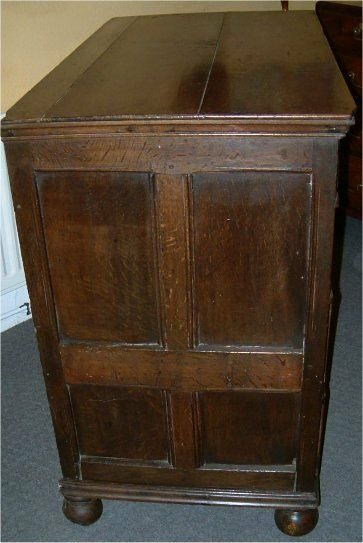 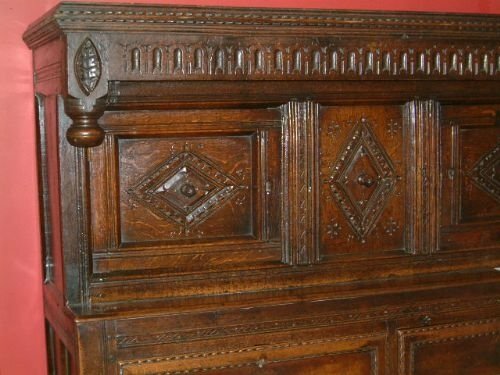 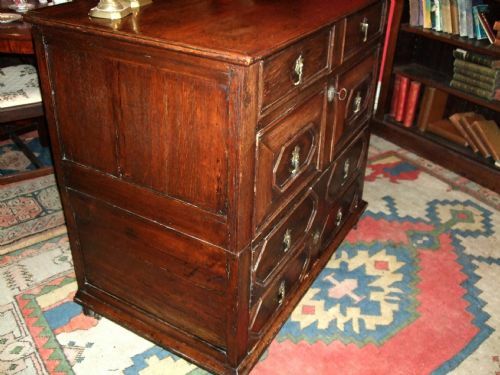 17th Century Oak Geometric Moulded Chest of Drawers. 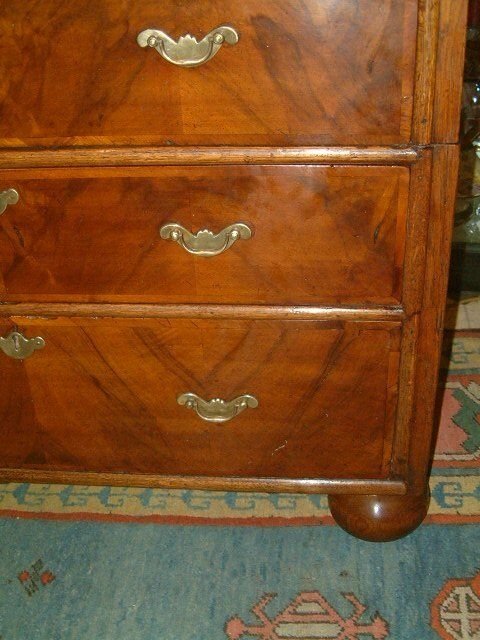 Good Colour & Patination Later Brasses. 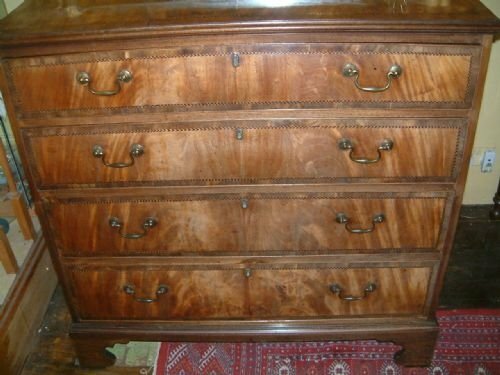 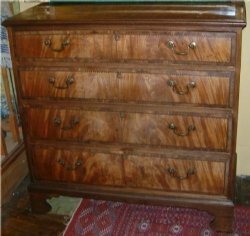 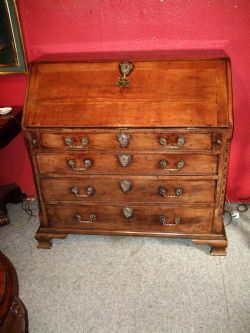 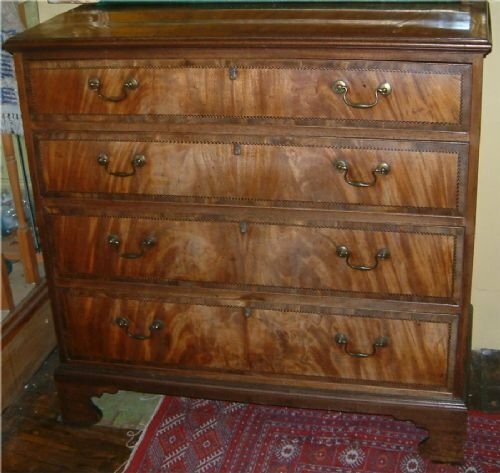 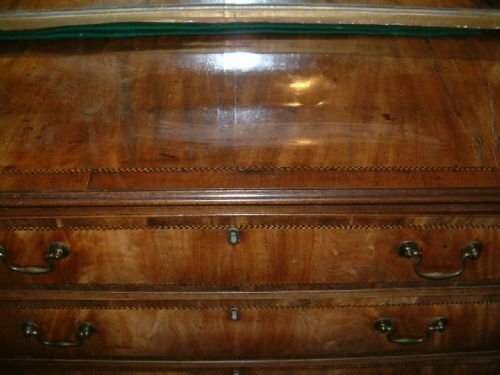 17th Century Walnut & Oak Chest Nice Colour & Patination with Good Figuring to the Walnut Front made in Two Halves with Panelled Sides Supported on Later Bun feet the Brasses Later Period. 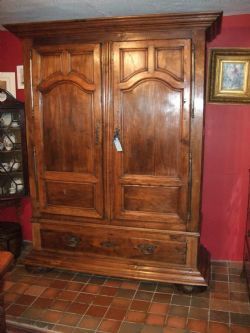 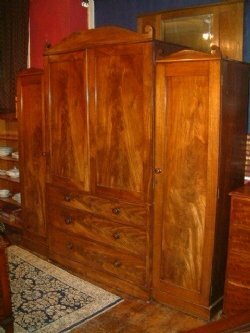 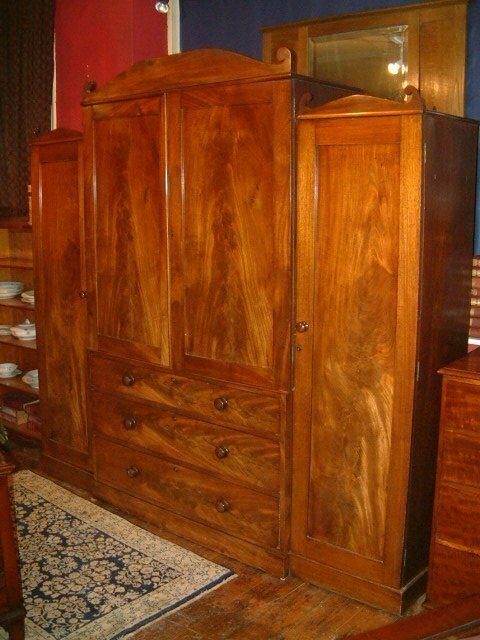 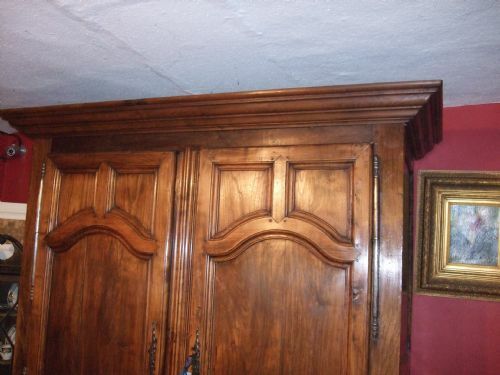 17th/18th French Oak Chestnut & Walnut Armoire Possibly Corsican. 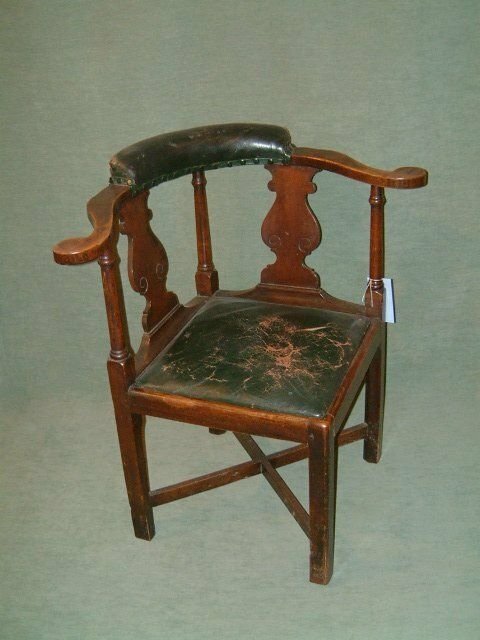 Superb Colour & Patination with Original Metalwork, and Supported on Large Bun Feet. 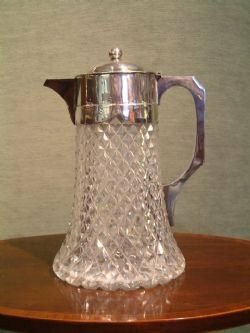 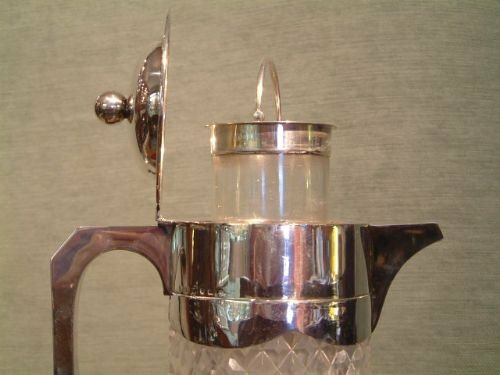 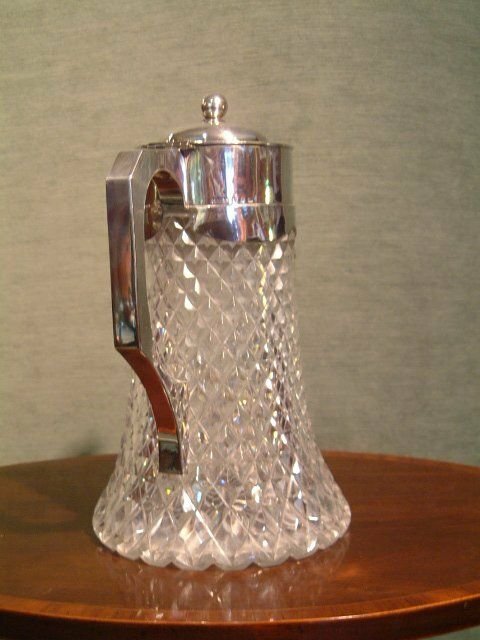 90" High x 71" Wide x Cornice Depth 28" Body Depth 24"
1893 Hallmarked Silver Top Claret/Lemonaid Cut Glass Jug with Liner for Crushed Ice. 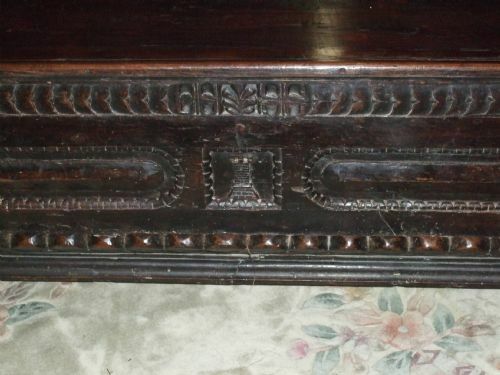 12" High x 6" Wide at Base. 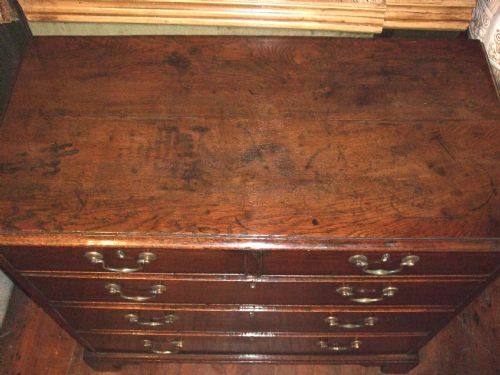 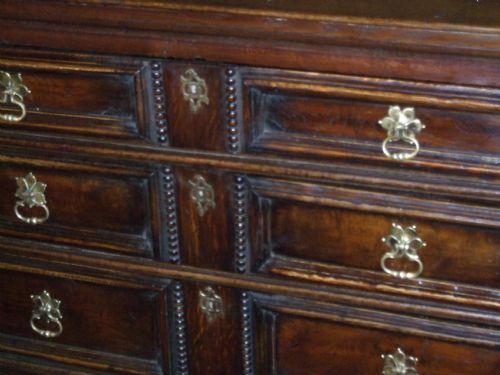 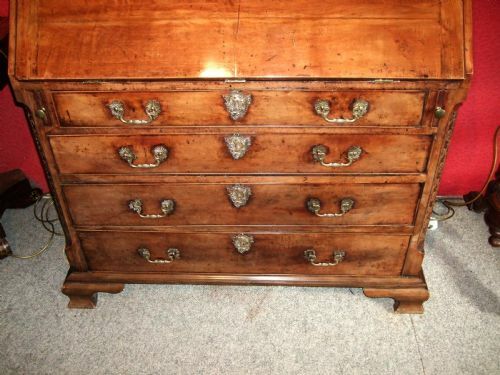 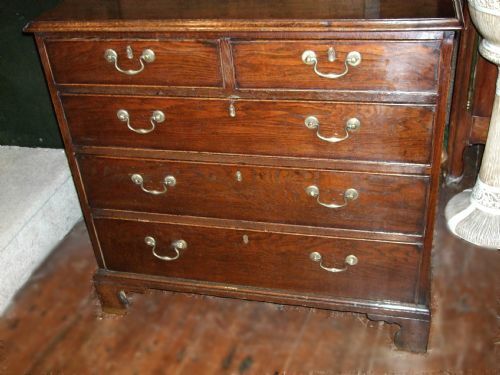 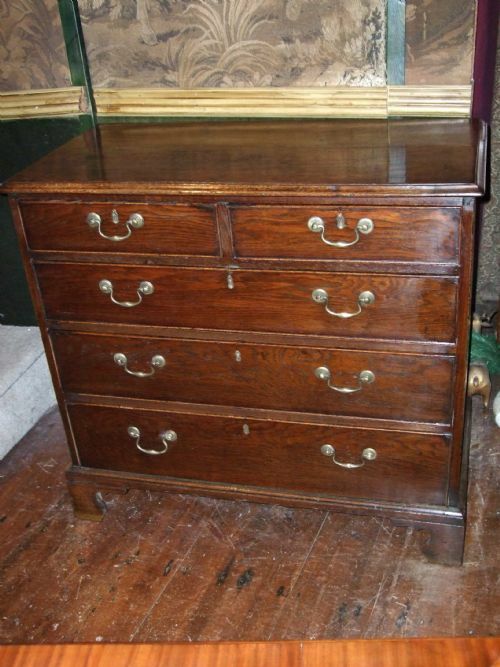 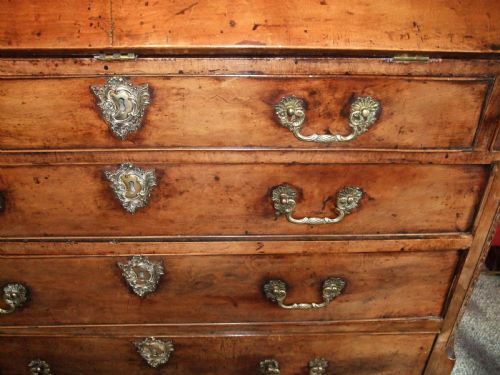 18th C Oak Chest of Drawers of Small Size with Original Brasses, Good Colour & Patination. 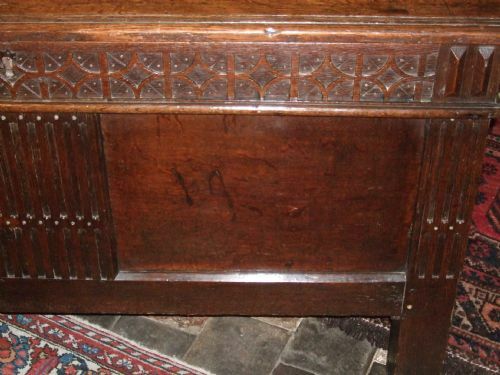 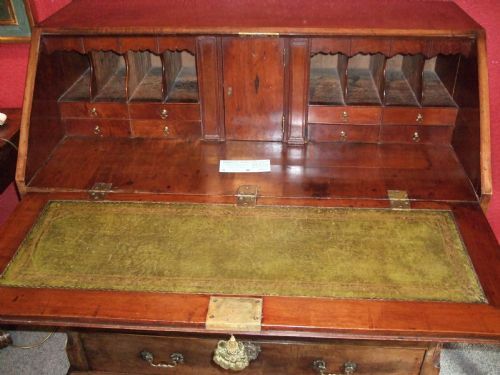 18th C Walnut Bureau with Fine Brasses, Fabulous Colour & Patination Blind Fretted Canted Corners Ogee Bracket feet. 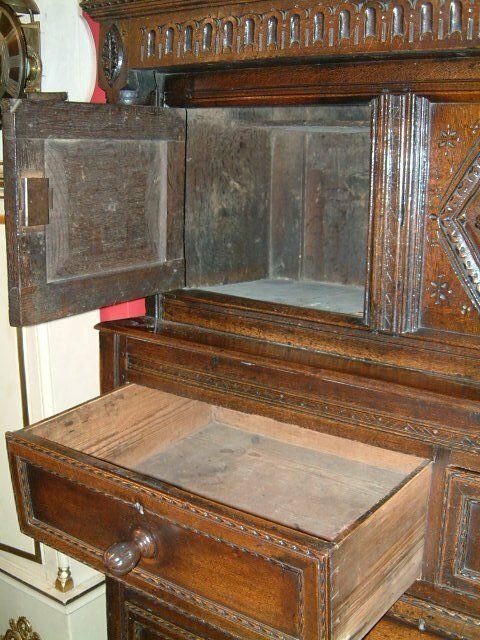 The Fall enclosing Fitted Interior with Secret Enclosures. 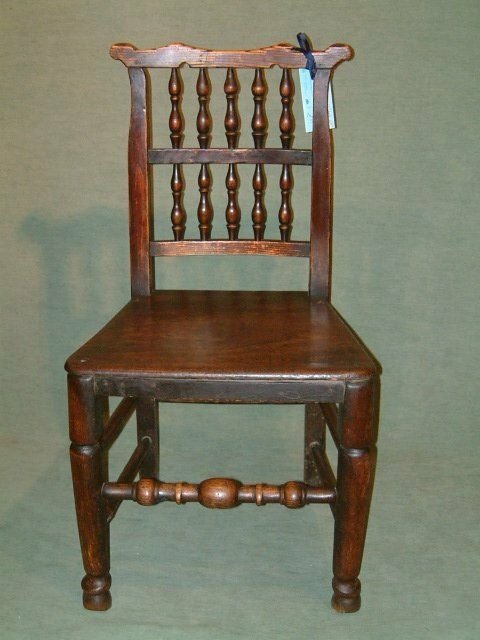 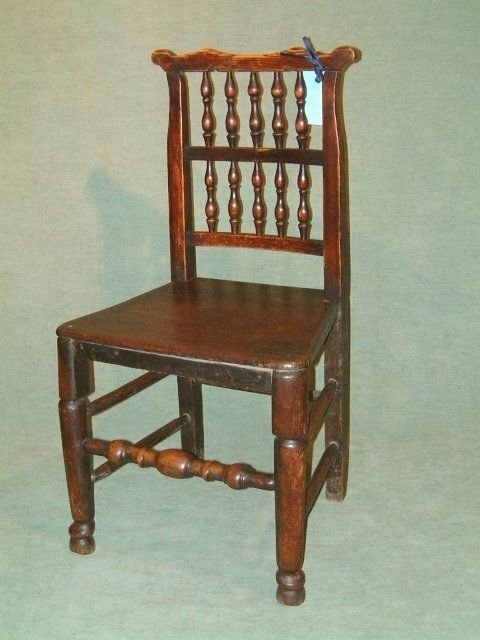 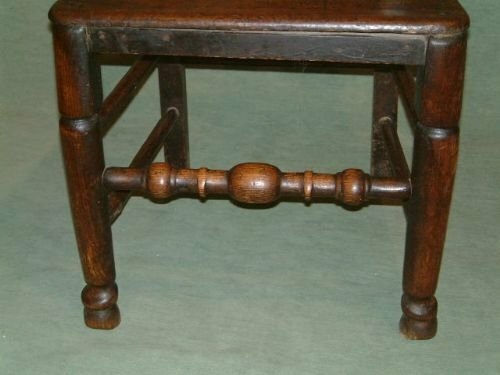 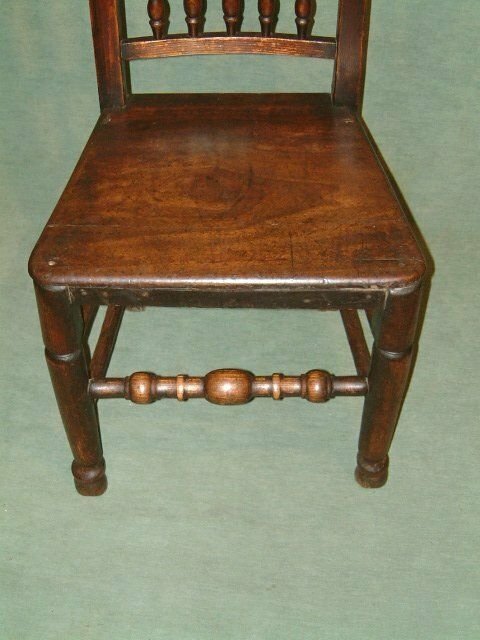 18th Century Country Chair with Bobbin Turned Back Made from Various Woods Mahogany Oak & Possibly Ash Nice Colour & Patination. 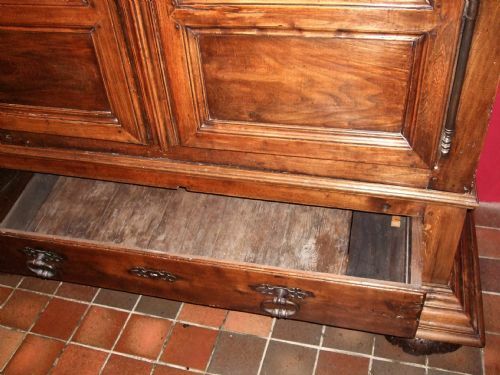 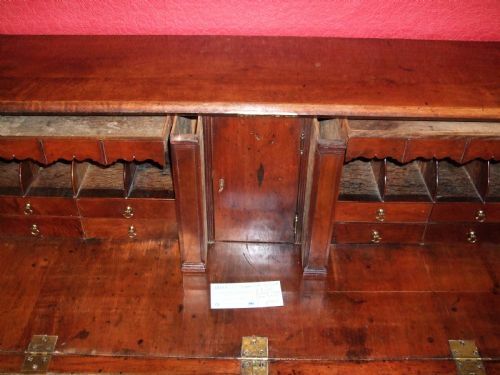 18th Century Country Made Cupboard Dresser with Three Drawers & Tree Cupboards made from Oak, Ash etc. 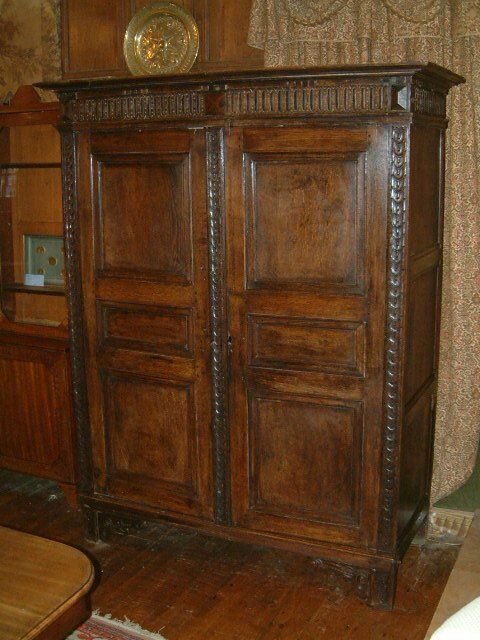 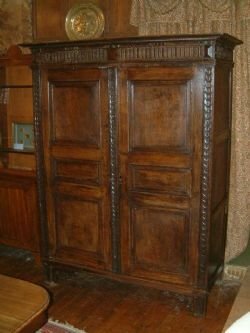 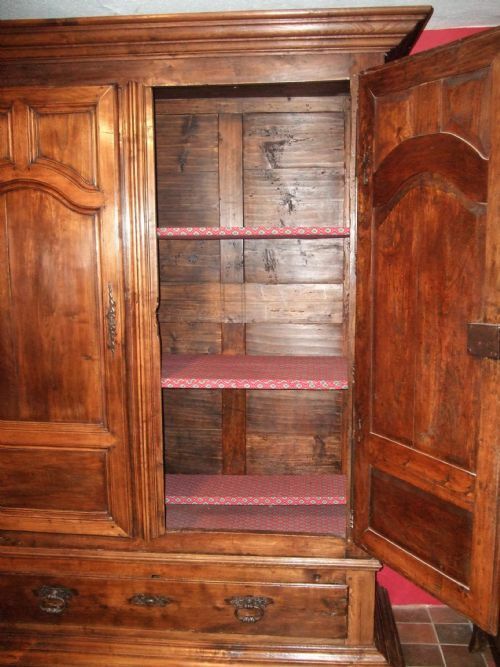 18th Century European Oak Armoire Possibily French because of its construction which flat packs with Bolts & Pegs. 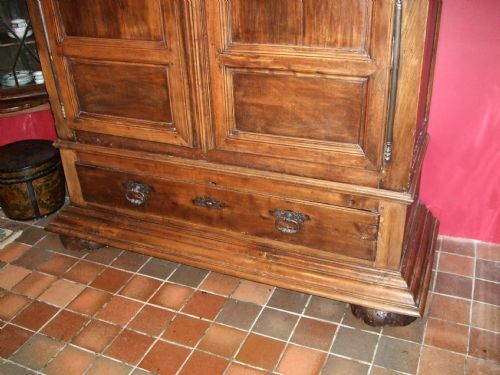 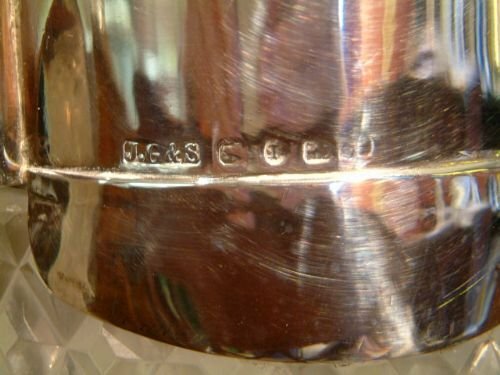 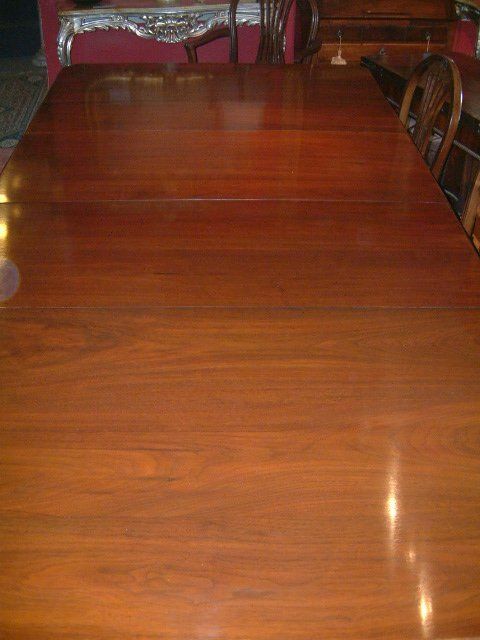 Great colour & Patination looks slightly darker than photos. 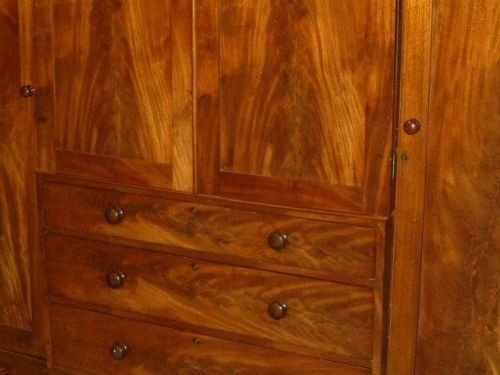 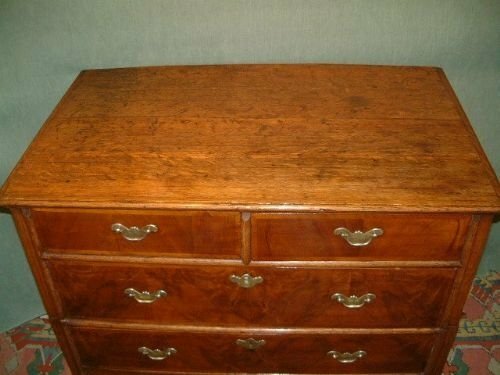 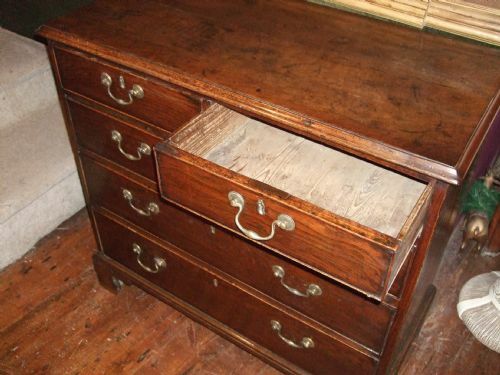 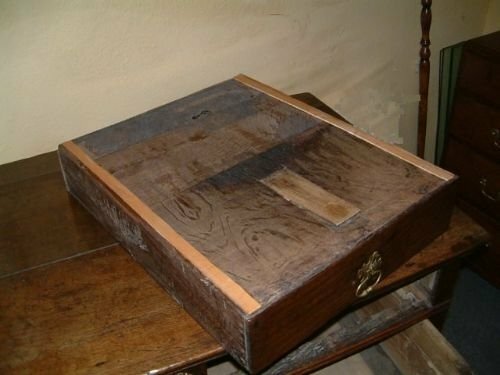 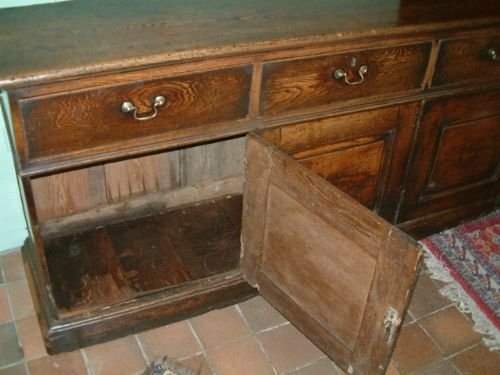 This Chest is in Two Parts sometimes called a Cottage Chest for easy Removal. 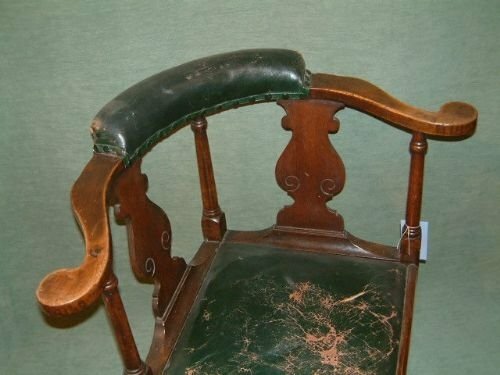 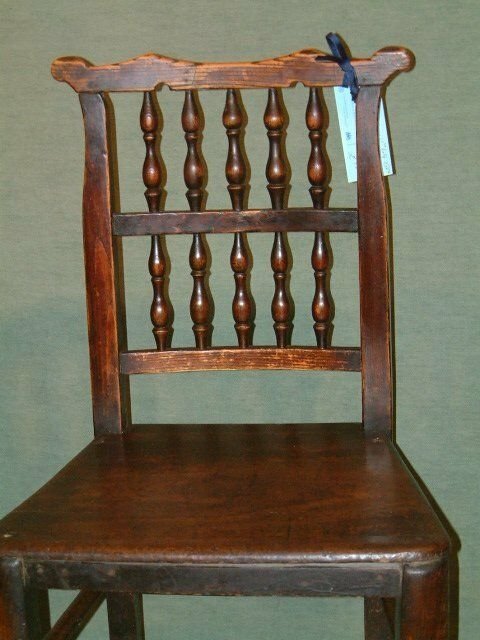 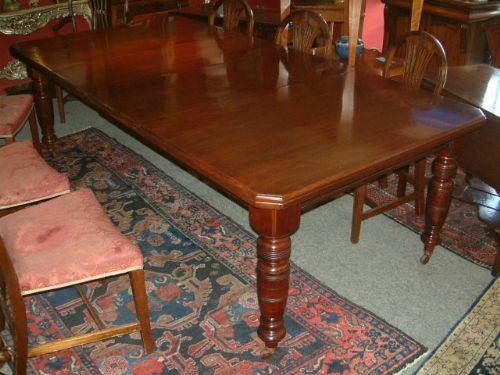 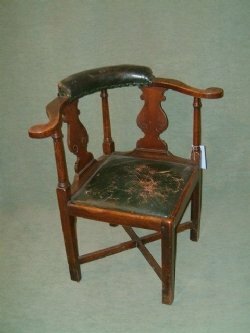 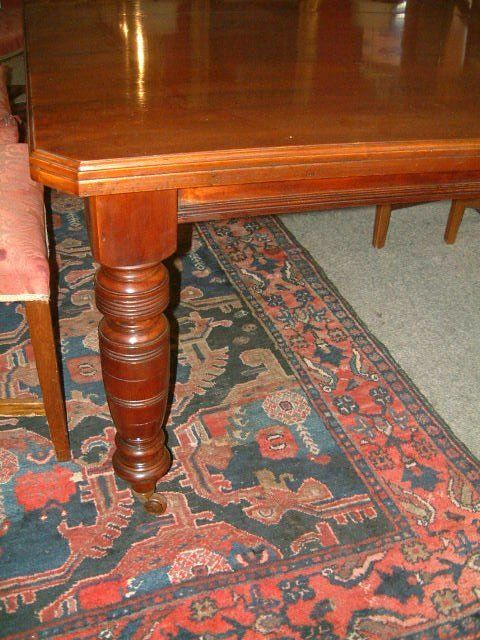 18th Century Georgian Mahogany Corner Chair with Green Leather Top Rail & Seat.